We’ve had our place near Bass Lake for about 14 years and we thought we had tasted at most of the wineries in the mountains. Several weeks ago, we ran across a group in our favorite little Mexican Restaurant in North Fork that had a wine we hadn’t tasted, from a local winery that we had forgotten about called Karine. The name rang a bell but for the life of me, I couldn’t figure out why until Karen remembered having a bottle of their Syrah a couple of years back with our friend Stephenie. Our new-found wine buddies at the restaurant couldn’t say enough good things about the wine so clearly, more investigation was needed…oh, the burdens that we take on for our readers. 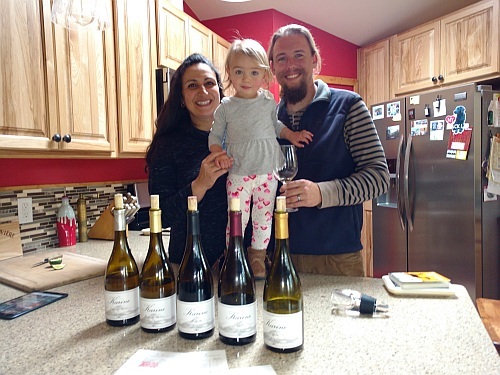 Karine winery is the love and toil of a young couple, Nick and Angeline DeHart and their almost two year old assistant wine maker, Emmeline Karine DeHart, clearly the driving force behind the entire operation. Nick grew up just down the road in Lemoore and Angeline was born and raised in Fresno. The couple met over beers at Fresno State where Nick was pursuing his degrees in Enology and Organic Chemistry and Angeline was getting her Masters in Special Education. Nick apprenticed in various areas in Europe such as Burgundy, Champagne, Alsace, and Tuscany earning an additional certificate in Switzerland. Fast forward four years and the couple were married in a vineyard. Both Nick and Angeline have roots in grape farming. Nick’s grandfather grew bulk wine grapes in the Central valley and Angeline’s family grew raisin grapes in the Fresno area so somehow, it seemed inevitable that after meeting over beer and being married in a vineyard, their life would gravitate to owning a winery. Unlike most wine makers however, Karine is a labor of love that they can indulge because Nick’s main job is consulting with a number of wineries, providing guidance for those who want to improve the quality of their wines. Karine, named after Angeline’s middle name (and now Emmeline’s), is a hobby and a passion for both rather than a necessity which means that the DeHarts can experiment with various Varieties and Vineyards in a never-ending quest for the perfect, pure, unmanipulated wines. If Karine makes a wine that is good but still below their exacting standards, they won’t sell it under their label but will sell it to other wineries. According to Angeline, “If it doesn’t knock your socks off, we won’t sell it”. I suspect most of Karine’s “failures” would be unmitigated successes for most wineries so it doesn’t seem to be a problem moving the wines that they don’t want to release. A big year’s production for Karine is around 300 cases. The couple are not interested in greatly expanding their production but would like the volume to increase just enough so that they can make their favorite wines every year instead of every second or third year. 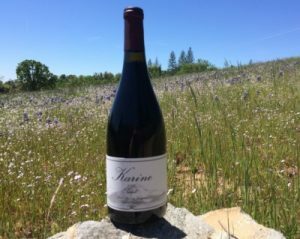 Karine considers itself a “Garagiste” winery, a movement that is about experimentation and occasionally upsetting the status quo when tradition is holding back the quality of wines. The only qualification to joining the Garagiste movement is a willingness to think outside the box and the open-mindedness to not accept winemaking practices as religious doctrine that must be followed, even if there are better, more progressive techniques that produce better wines. Like all good winemakers, Karine understands that wine starts in the vineyard and the best way to produce exceptional wines is to have exceptional wine grapes that need little or no manipulation by the winemaker. In true Garagiste fashion, Karine makes wines that you either “Love to Love” or “Love to Hate”. We had planned on tasting with the Karine folks the weekend before at the site of their upcoming winery location just outside of North Fork but mother nature threw us a curve by raining two weekends in a row…great for a rain starved California…not so great for outside wine tasting. We were also up against a deadline due to the imminent arrival of Emmeline’s little sister. Nick is currently experimenting with various wine grapes to ascertain which Varieties will work the best at their upcoming vineyard including Tempranillo (Tinta del Toro), Mourvedre, Petite Sirah, Charbono, Graciano, Grenache, Touriga Nacional, Cabernet Sauvignon, Viognier, Roussanne, Vermentino and Piquepoul. Karine wants to let the terroir of the vineyard really influence the wines and for terroir to be prevalent, that means the winemaker needs to modify the wine as little as possible. Oak, additional acid and a number of other techniques can combine to improve a decent wine but all of those techniques begin to mask the true character of the wine grape, something that Karine resists as much as possible. According to Nick, it will be decades until they understand the terroir of their vineyard, its characteristics and which Varieties really produce the best wine grapes in it. It will be their grandchildren that truly understand how to coax the best wine grapes out of the vineyard. 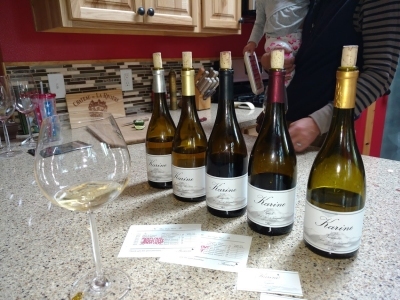 With a field trip clearly not in the works and in need of a venue, we volunteered our kitchen so Winery-Sage experienced a first… a wine tasting of some really special wines with the winemaker in our own home. Now I could really get used to this! The first two wines were a 2013 Chenin Blanc and a 2013 Malvasia Bianca, both from Madera County’s own Freeman Vineyards. Candidly, I have never really been a fan on Chenin Blancs. The ones that I’ve had until just the last few months were slightly sweet, thin wines with no character at all. Another winemaker friend of ours produced her first Chenin Blanc this year and it was a very pleasant eye opener so we were excited to see what Karine had made of it. We weren’t disappointed. We’ve now realized that Chenin Blanc seems to be a victim of most California winemakers rather than a perpetrator. Karine’s on the other hand, was a full bodied gem, produced from local 40+ year old vines which sadly, have now been ripped out. Three months ago if someone would have told me that I’d be tasting five very good wines and my favorite would be the Chenin Blanc, I’d have assumed that they had recently escaped from a very “special” hospital. It was also one of Karen’s two favorites (the other being a Syrah that came later in our journey). I asked Nick which was his favorite. I think he believes that would be like choosing a favorite kid but I could tell he was proud of this one. There was virtually nothing added to the wine during winemaking…just the wine grapes and a little bit of nutrient to help the naturally occurring yeast do their job. The Malvasia Bianca was also quite good, with all of the aromatic characteristics typical of the variety but also having a little more body than most other versions we’ve had in California. Both wines were quite low alcohol for California wines, checking in at 11% and 12% respectively. At the end of the tasting we also tried a 2012 Viognier that Nick said had just passed its peak but hadn’t really started to degrade yet but it was starting to change character. If that wasn’t its peak, it must have been spectacular a year ago because it was a pretty damn good Viognier. The other two wines were red, usually my favorite but the first, Mourvedre is one about which I’m pretty ambivalent. Most that I have had are medium bodied, character-less filler. Karine made theirs in a Pinot Noir style, meaning it was even lighter than usual. Surprisingly what I thought would be just a slightly lighter, characterless wine based on past experience was anything but bland. The light hand of Nick allowed the subtleties of the grape to shine without being masked by an attempt to make it a deeper wine than Mourvedre should be. The result was a light red wine with a complexity that will tickle the taste buds rather than bludgeoning them. This was a perfect wine for a filet mignon…too bad we didn’t have any. The last taste, until the obligatory revisiting and re-revisiting etc…was a Syrah with a depth of flavor to spare. It was quite good but Nick said it really shines after being open for 24 hours. Sadly, the bottle never stood a chance of being opened and not finished in 24 hours, a fate that awaited several of the other bottles as well. Both the Mourvedre and the Syrah are also from Madera County, but these were from Love Ranch, a well-known local vineyard from which some of the best local winemakers source fruit. It’s great to meet folks that have a passion for wine that is greater than ours and based on the rapport that we struck up with Nick, Angeline and Emmeline, we’ll be sharing more wine and meals with them (assuming Emmeline allows the inventory to leave the winery of course). The folks at Karine don’t have a wine club and look to sell their wines to local folks who will appreciate the character that are inherent in them. They are often sold out of various wines so don’t go in expecting to get a specific wine but based on our tasting, whatever is available will be a treat.